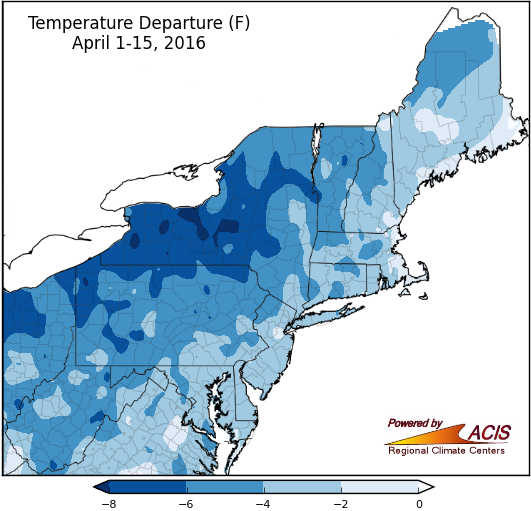 The first half of April was colder than normal in the Northeast. 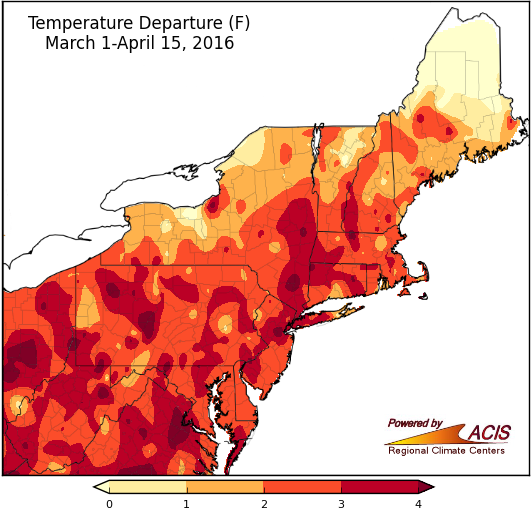 Following a mild March, temperatures took a nosedive in April. The first half of the month was 2°F to 8°F colder than normal for most of the region. In fact, a few areas in western and central New York were more than 8°F below normal. 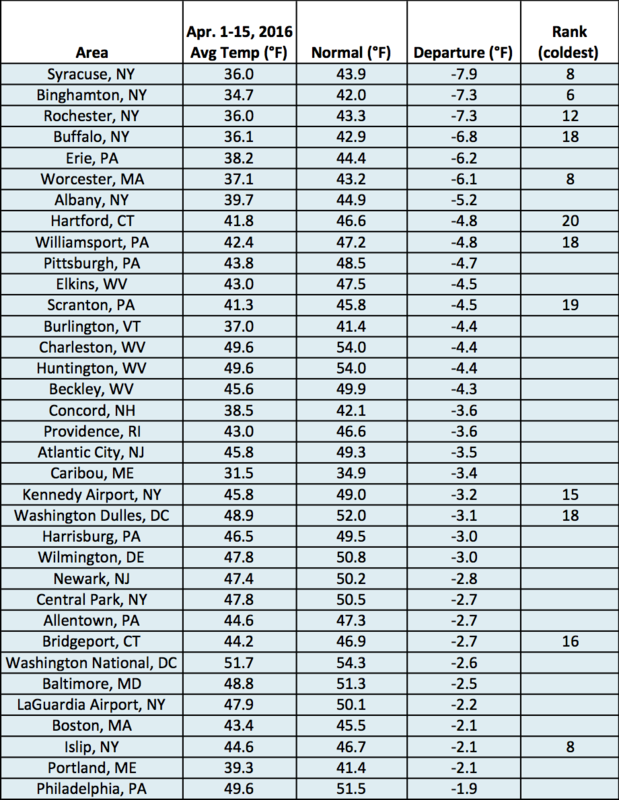 All 35 major airport climate sites saw below-normal temperatures, with twelve of them ranking it among their top 20 coldest starts to April. Temperatures through mid-April were 2°F to 8°F below normal at most of the airport climate sites. March 1 - April 15 temperatures ranged from below normal in northern Maine to more than 4°F above normal. Due to the mild March, temperatures for the first half of spring were 1°F to 4°F above normal for a majority of the region. All but six of the airport climate sites ranked the first half of spring 2016 among their top 20 warmest. Caribou, ME was the only airport climate site to have a below-normal temperature for the first half of spring. Precipitation was variable during the first half of April. 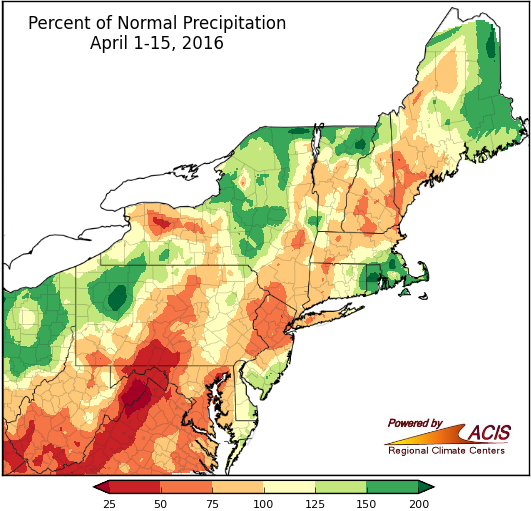 During the first two weeks of April, precipitation ranged from less than 25% of normal to more than 200% of normal. The driest spot was in the panhandle of West Virginia, while the wettest spots were in parts of New England, northern New York, and western Pennsylvania. 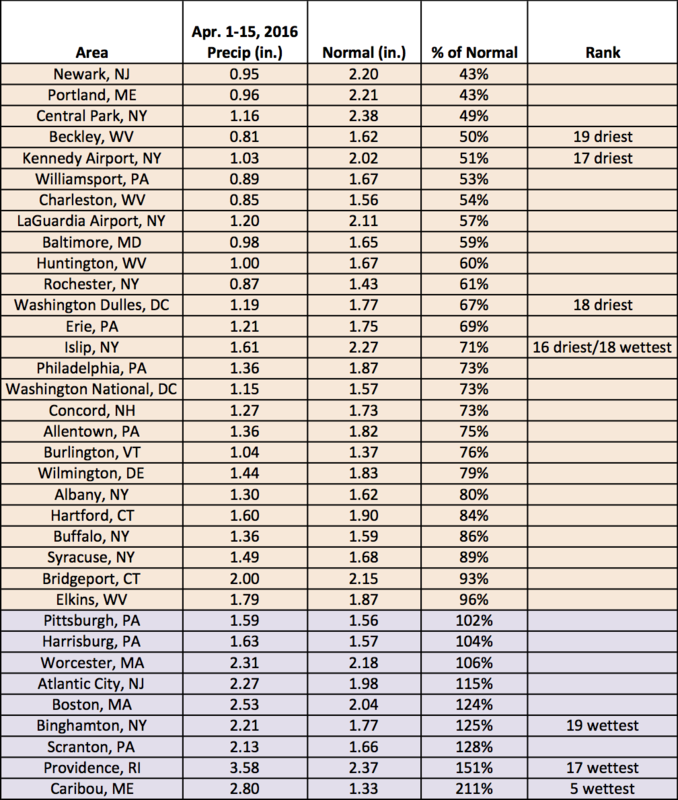 Of the 35 airport climate sites, 26 saw below-normal precipitation. Four sites had a top 20 dry start to April, while three sites had a top 20 wet start. Precipitation during the first half of spring was less than 125% of normal for most areas. 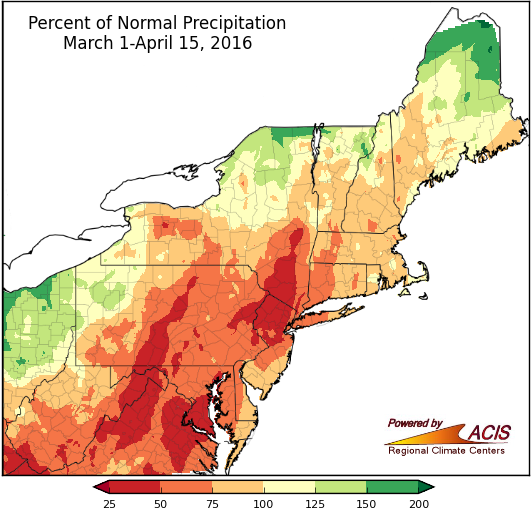 From March 1 through April 15, precipitation ranged from 25% of normal to 200% of normal. Parts of West Virginia, Maryland, Pennsylvania, northern New Jersey and southeastern New York were the driest. Conversely, parts of northern New York and northern Maine were the wettest. 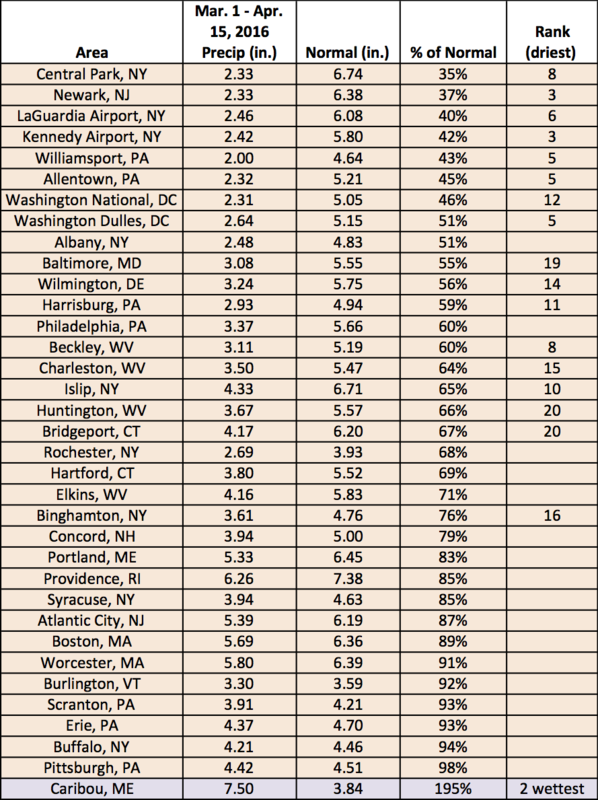 Thirty-five airport climate sites saw below-normal precipitation, with seventeen of those sites ranking the season-to-date among their top 20 driest. Caribou, ME had its second wettest first half of spring. Snowfall was also variable during the first half of April. 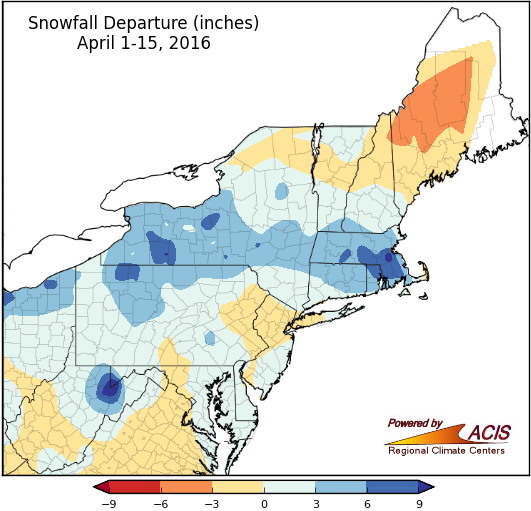 April 1-15 snowfall ranged from 6 inches below normal to more than 9 inches above normal. The largest deficits were in western and northern Maine, while the greatest surplus was in the highlands of West Virginia. 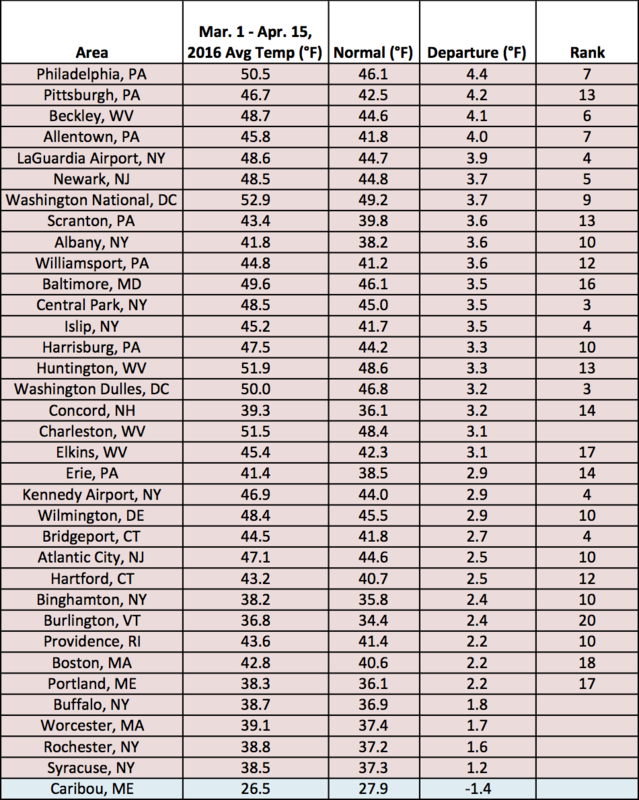 Only nineteen airport climate sites saw above-normal snowfall, but 23 sites ranked it among their top 20 snowiest starts to April. Snowfall departures ranged from about 2 inches below normal to around 8 inches above normal at the airport climate sites. 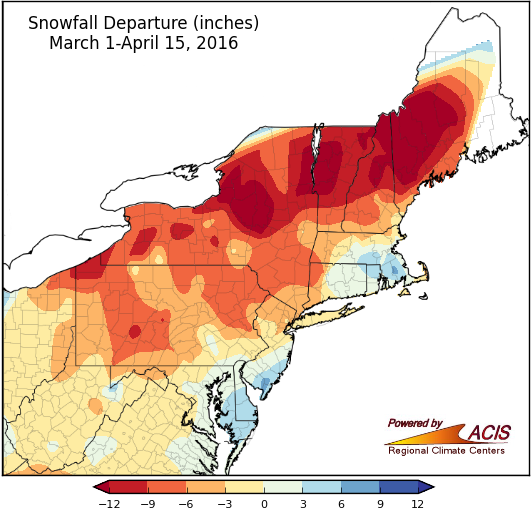 For the first half of spring, most areas saw near to below-normal snowfall. Snowfall ranged from more than 12 inches below normal to 6 inches above normal for most of the region. Parts of New York and northern New England had the largest deficits. Eastern Maryland, southern Delaware, southern New Jersey, northern Rhode Island, southeastern Massachusetts, and northern Maine were 3 to 6 inches above normal for March 1 - April 15 snowfall. 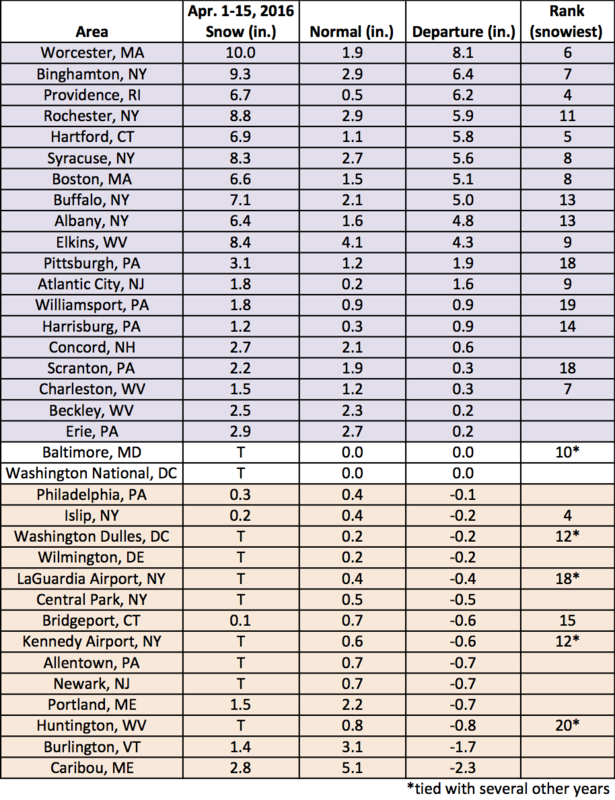 Four sites had a top 20 least snowy start to spring, while Atlantic City, NJ had its 19th snowiest start. 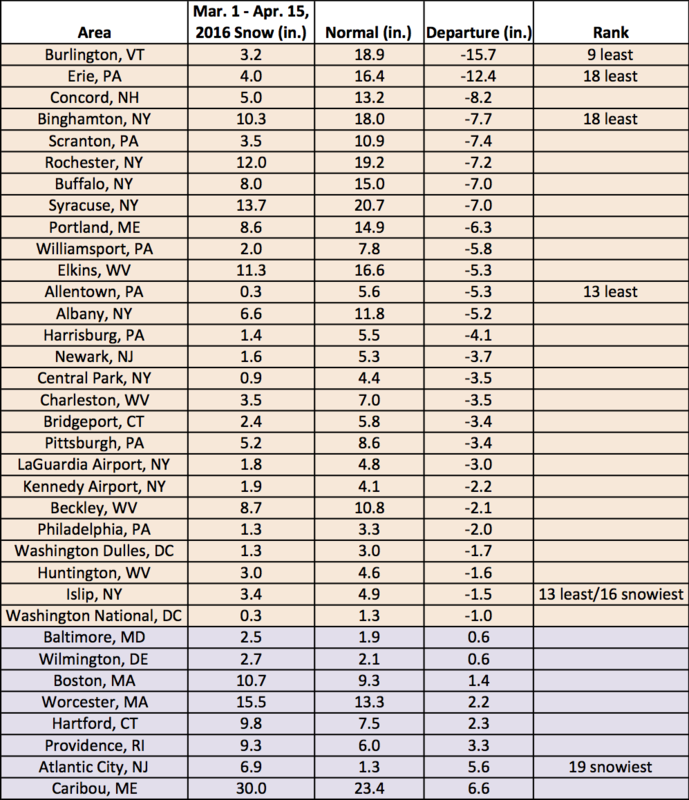 Due to Islip, NY’s shorter period of record, the first half of spring 2016 ranked among both the top 20 least snowy and top 20 snowiest.